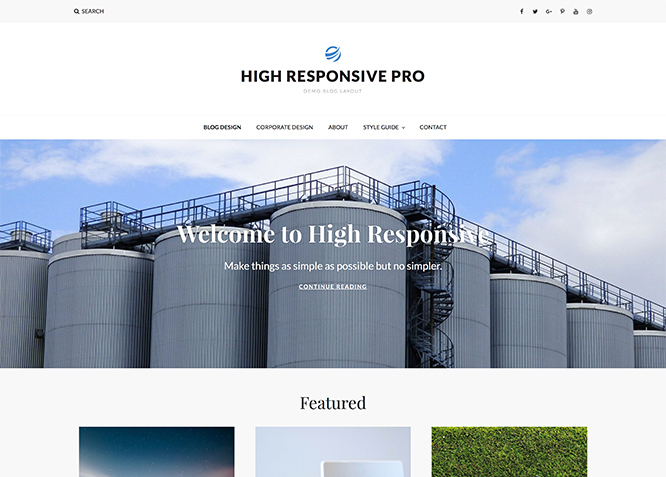 High Responsive Pro – A Multipurpose Responsive WordPress theme specially designed to give you an opportunity to create any kind of website you desire, be it a blog, eCommerce store, portfolio or a corporate website. A multipurpose WordPress theme, High Responsive Pro ensures your website is simple, clean and user-friendly. 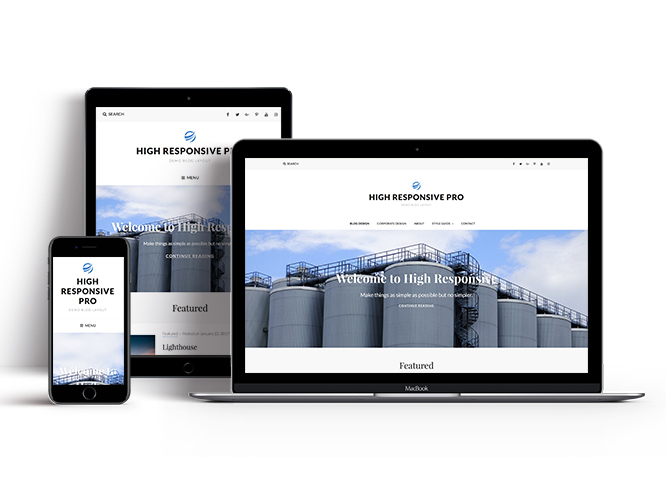 Staying true to its name, High Responsive Pro is completely responsive and comes with features fit for promoting products and services, ability to create a professional portfolio, social media integration, eCommerce support and much more. The theme is impressive, aesthetically pleasing and guarantees a superior browsing experience for your page visitors. 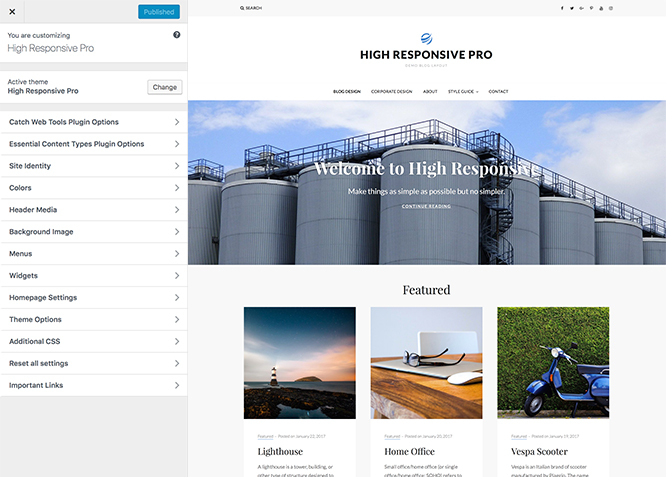 High Responsive Pro is an innovative, simple yet feature-rich theme that provides a flexible framework for any type of websites with a clean outlook. This theme is translation ready. For more details check out the Theme Instructions. Featured Image Grid Content allows you to not only add images, but also write a description for them. If a descriptive caption would not suffice, you also have the option of providing a clickable link. This way, as per your unique needs, should you require, you can easily add a URL to your content. Featured Page Grid Content is an option that is helpful to highlight noteworthy pages on your site. You can have columns of content as well as selected images set on your grid container. #How to disable Site Title and Tagline? Go to "Appearance => Customize => Header Media"
#How to add/edit Header Media Text? Go to "Appearance => Customize => Theme Options => Header Media Option"
#How to add/edit Date, Contact Number and address in top header? Go to "Appearance => Customize => Theme Options => Header Top Options "
Clik Disable date to disable date from appearing on your site. Add email, phone and address to display them on your site. High Responsive Pro offers exciting Menu Options! This theme supports and recommends using "Custom Menus". You can create Custom Menu through "Appearance => Menus" from your WordPress Dashboard. You can assign your custom menu in 2 different locations. You assign it either from "Appearance => Customize => Menus => Manage Location" or from "Appearance => Menus => Manage Location"
#How to change Menu Options? Go to "Appearance => Customize => Theme Options => Menu Option"
Disabling Primary Menu : Check on "Check to disable Primary Menu". Enabling search box in primary menu :check on "Check to enable search box in Primary Menu"
High Responsive Pro supports 4 featured slider types they are: 1. Post , 2. Page, 3. Category and 4. Custom. For Featured Slider Options, go to "Appearance => Customize => Theme Options =>Featured Slider". High Responsive Pro supports 5 featured content types to choose from: 1. Post, 2. Page, 3. Category and 4. Custom. 5.Tags (via Jetpack) For Featured Content Options, go to "Appearance => Customize => Theme Options => Featured Content". High Responsive Pro supports 4 Hero Content types to choose from:1. Post , 2. Page, 3. Category and 4. Custom. For Hero Content Options, go to "Appearance => Customize => Theme Options => Hero Content Options". #How to add portfolio in theme using Custom Post Types? #How to add featured content in theme using Custom Post Types? #How to add services in theme using Custom Post Types? #How to add testimonials in theme using Custom Post Types? High Responsive Pro currently has 7 widgetized (Sidebar) areas thay are: 1. Sidebar, 2. Footer Area One, 3. Footer Area Two, 4. Footer Area Three, 5. Footer Area Four. 6. Content Bottom 1 and 7. Content Bottom 2 Go to "Appearance => Widgets" or "Appearance => Customize => Widgets" in WordPress. High Responsive Pro has 14 Widgets to choose from. They are: 1. CT:About, 2.CT:Advertisement Codes, 3. CT:Advertisement Images, 4.CT:Featured Embeds,5. CT:Featured Images, 6. CT:Featured Pages, 7. CT:Featured Posts, 8.CT:Gallery Images, 9. CT:Galley Pages, 10. CT:Galley Posts, 11.CT:Instagram, 12.CT:Newsletter, 13. CT: Social Icons and 14. CT: Tag Cloud. You can add widget in widget area as per your need. #How to add "About" information in widget area(CT:About Widget)? #How to add "Advertisement Code" in widget area(CT:Advertisement Codes)? #How to add "Advertisement Image" in widget area(CT:Advertisement Codes)? Then under "Image Url" add Url of image, you can further add "Image Link" and "Alt Text"
#How to add "Featured Embeds" in widget area(CT:Featured Embeds)? #How to add "Featured Images" in widget area(CT:Featured Images)? #How to add "Featured Pages" in widget area(CT:Featured Pages)? You can further find option to "Disable Image" and "Disable Title"
#How to add "Featured Posts" in widget area(CT:Featured Posts)? You can further change "Post Meta Info"
#How to add "Gallery Images" in widget area(CT:Gallery Images)? Add "Title", change "Layout" and "No of Items"
#How to add "Gallery Pages" in widget area(CT:Gallery Pages)? You can further find option to "Disable Title"
#How to add "Gallery Posts" in widget area(CT:Gallery Posts)? You can further change "Post Meta Info" and "Disable Title"
#How to add "Instagram" in widget area(CT:Instagram)? #How to add "Newsletter" in widget area(CT:Newsletter)? #How to add "Recent Posts" in widget area(CT:Recent Posts)? This widget is display featured posts with thumbnails. Add "Title", change "No of posts", "Image Alignment", "Image Size" under the respective field. High Responsive Pro has 2 Site Layout, 4 Singular Content Layout options and 4 Woocommerce Layout options image layout to choose from "Appearance => Customize => Theme Options => Layout Options"
Once you are in Layout Options, you can Check the option below "Site Layout" which will set your site layout. #How to enable/disable Zoom, Lightbox and Slider effects for WooCommerce Product Gallery?